BNZ proudly introduces BB-Blok (patent pending: Pittsburgh Consultants Limited), a new concept in flat suspended arch construction. BB-Blok is a single large block of insulating fire brick (IFB) to which a suspending anchor (stainless steel or ceramic) has been attached. 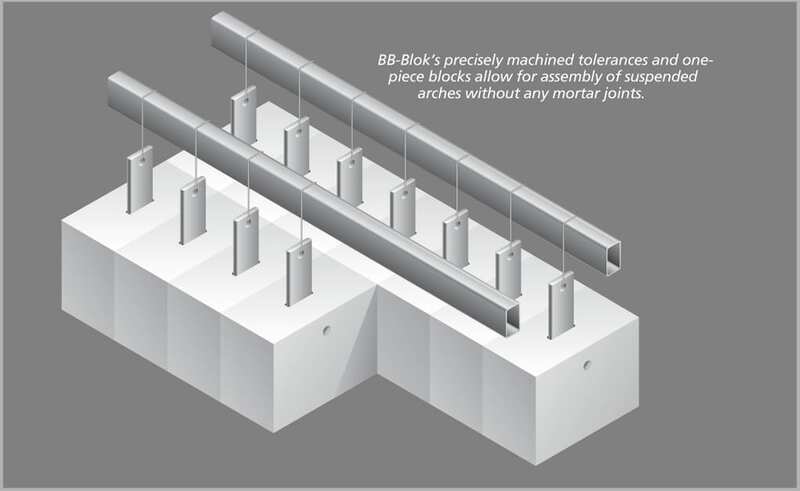 The unique feature of BB-Blok is the absence of a mortar joint in achieving a thickness of 115 mm (41⁄2″). There are numerous advantages of BB-Blok over the traditional built-up units. This brochure will introduce you to those advantages. A flat suspended arch made of IFB has been an accepted method of kiln roof design in the ceramic industry for many years. Now, a new product is available to overcome the limitations and shortcomings of the traditional IFB roof modules. BB-Blok offers three significant advantages over the older designs. BB-Blok has no mortar joints that allow rapid heat transfer. Each block is machined to precise dimensional tolerances including squareness. Because there are nouneven mortar joints the blocks fit together snugly with no gaps. The patented ceramic hanger is more resistant to heat than the traditional stainless steel hanger, allowing for increased thicknesses of inexpensive backup insulation thus less heat loss and lower fuel consumption. The patented hanger system allows for thinner and therefore less expensive modules. Traditional hangers (AISI 321) should be protected from reaching temperatures in excess of 750°C, accomplished by specifying thicker, more expensive IFB blocks. A common reason for premature furnace shutdown is to replace broken roof units. The old style of construction utilizing stainless hangers mandates quick shutdown and replacement of any spalled unit before the hanger fails (because of elevated temperatures). BB-Blok’s unique ceramic hanger allows the furnace to be run safely until a controlled/scheduled shutdown is carried out. Suspended flat arches are a very economical means of constructing a kiln or furnace roof. Their use is widespread in many industries. A thorough understanding of proper design and installation practice is necessary to ensure maximum life of the lining. A general rule worth following is to limit the use of the suspended roof design to applications where the temperature will not exceed 1345°C (2450°F). Above this temperature, the better solution is to utilize a sprung arch construction. IFB exposed to higher temperatures is limited in its ability to resist forces of traction. This applies to even the highest IFB grades. Nearly all applications in the ceramic industry can be filled by BNZ 26-60 IFB. It is a specially formulated brick with a high alumina content that is very stable, shock resistant, alkali attack resistant, and has a very low thermal conductivity. For lower temperature furnace roofs, BNZ 23 HS is equally good. BB-Blok’s unique ceramic hanger overcomes the two primary shortcomings of normal stainless steel hangers. Ceramic hangers withstand temperatures up to 1300°C nearly 400°C higher than the limit of stainless steel. The traditional stainless steel hanger is embedded approximately 50 mm from the cold face of a module. Care must be exercised during design to ensure that the maximum temperature limit of the anchor is not exceeded. Module failure can occur, resulting in premature shutdown of the furnace. Ceramic hangers resist chemical attack better than stainless steel hangers. Chemical attack can occur in a ceramic kiln when corrosive elements condense out of gasses that have penetrated the IFB modules in positive pressure zones. The path of these gasses is most often through the gaps that exist between mortared blocks. As stated previously, this is not a problem with BB-Blok because of the precision machining. Roof thickness is a function of two design criteria that oppose one another in the old style modules: energy conservation; and the physical limitations of the steel hangers as discussed above. The desire for energy efficiency necessitates thick layers of backup insulation, causing the hangers to be subjected to temperatures above safe limits. The solution is to sacrifice energy efficiency to protect the hangers, or to specify thicker brick modules. Thicker IFB effectively move the anchor tip away from the hot face, but drives up the cost of the modules. 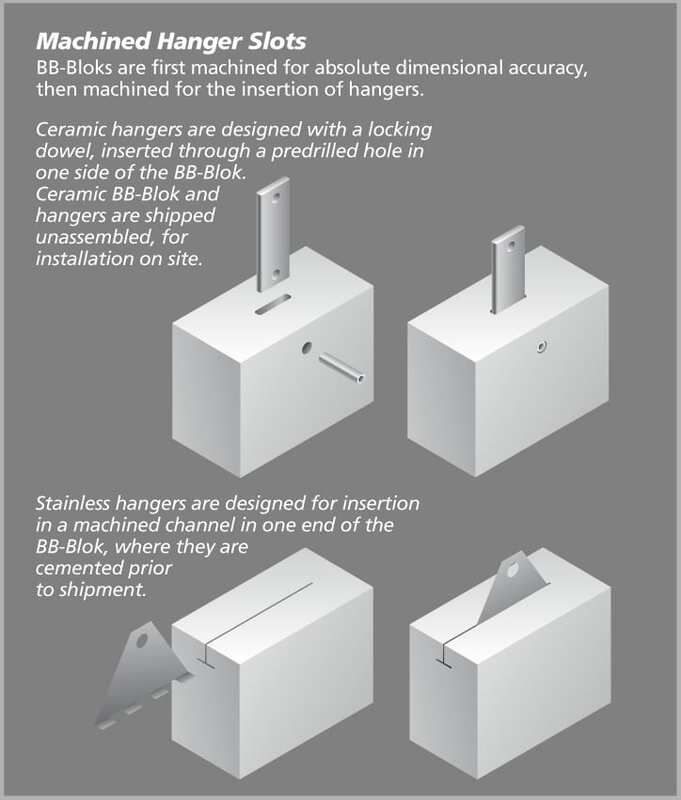 By specifying the new BB-Blok with a ceramic hanger, additional insulation can safely be installed without worry of anchor failure from too high temperatures. BB-Blok construction can even allow the designer to specify thin roof designs for high temperature furnaces. This is ideal for shuttle kilns because heat storage in the roof will be lower. Several examples of typical heat flow profiles are available from the nearest BNZ office. The precise machining of BB-Blok, and the absence of mortar residues, allow for tight construction and minimal gaps between modules, compared to the old style. Traditionally, a layer of backup insulation 50 mm to 76 mm thick is applied to roofs utilizing stainless steel hangers. 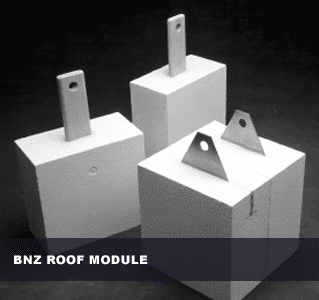 A BB-Blok roof with ceramic hangers can be insulated up to 150 mm thick. This can be refractory fiber, insulating cement or mineral wool in various combinations. Care must be taken to not limit the ability of the brick modules to move slightly during heat-up, as pinch spalling can result. BNZ can recommend a special, newly developed sealing system that is both flexible and resists gas penetration. The most common type of failure necessitating shutdown and repair is a result of a single block spalling and dropping out of the roof. A block can fail due to improper installation, physical abuse before installation, or from thermal shock. Replacement of the block is necessary before the anchor fails leaving a hole in the roof and causing damage to the anchors of surrounding modules. A mishandled BB-Blok can also fail, but when outfitted with the ceramic hanger, the emergency is removed from the situation. BB-Blok can be left in place with no danger of anchor failure until the next scheduled shutdown. BNZ has completed extensive tests of the BB-Blok system, simulating years of life in a typical furnace by running rapid heat-up cycles firing at a steady state for extended periods, and inducing thermal shock during rapid cool-downs. The test kiln was insulated 50% more than normal in order to verify the stability of the anchoring system. Selected modules were broken out to simulate spalling. In all cases, under the most severe stresses, the BB-Bloks remained in place without failing. The recommended heat-up schedule for BB-Blok roof modules is a regular and even temperature rise reaching 1235°C (2250°F) in 4 hours or more. Proportionally longer times are suggested for higher operating temperatures. This guide is not intended to be comprehensive in all aspects of kiln design and materials specifications and therefore BNZ cannot accept liability for any damages arising out of misapplication of its products based on a reading of this guide. Contact a BNZ office or your BNZ distributor for technical advice.